I sincerely hope you’re enjoying the change of season and taking time for some of your favorite activities. My favorite thing to do, of course, is to serve people like you. There’s something about being around my customers that I really enjoy. As a matter of fact, I heard recently that happiness is contagious, and it sure makes sense to me. If my customers are happy, then I’m happy. See how contagious that is? Remember, cold weather is just ahead. Be sure to call us for your tune-up so you and your family will be ready. We’re happy to help however we can. Please let us know if you have friends and family who would also like to receive our newsletter and we will be glad to put them on our list. One of the best things you can do to keep your cooling and heating systems in top working condition is to have regular preventative HVAC maintenance performed by the home comfort professionals at J & R Heating. There’s no better time for a full system tune-up and inspection than early fall (a.k.a. right now! ), before it’s time to put your system back to work for approximately another 6 solid months. It kind of makes you shiver in your shorts just thinking about winter, right? 1. Save energy. A bunch can happen to your heating system over time that prevents it from operating efficiently. When we inspect your heating system, we’ll make sure it’s running as smoothly and efficiently as possible, which helps cut down on the amount of energy it uses. 2. Avoid unnecessary repairs. You can stop problems before they start, by scheduling annual preventative maintenance once a year. This will minimize the number of times you need to call us to make repairs, and that saves you time, energy, and moola. 3. Keep your home safe. If you have a gas furnace like many area homeowners do, there’s a chance that CO (carbon monoxide) can leak into your air. An important step in our tune-up and inspection process is thoroughly checking your heat exchanger to see if it has cracks. Another critical step is checking and tightening all electrical connections, which may potentially prevent an electrical fire. 4. Extend the life of your system. A regularly maintained system will simply run better and last longer than one that receives none or only sporadic preventative maintenance. Think of it this way, you wouldn’t continue using your car without getting the oil changed regularly, would you? Not only is the best time of year for a J & R Heating heating system tune-up and inspection, you can also save big by being on our maintenance agreement program. 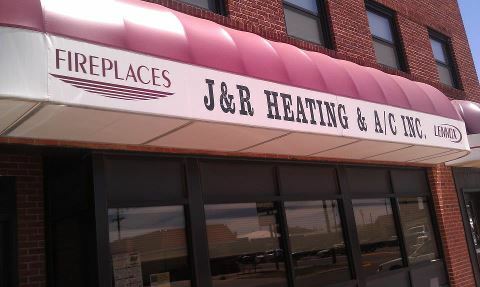 Call us now to schedule your heating system tune-up and ask us about our maintenance agreement program at 402-362-5702. Garbage Disposal: John W. Hammes got the garbage disposal patented by 1935 and had it on the market by 1940. He made the very first garbage disposal in 1927 in Racine, Wisconsin. Washer: Clothing washers have been around since almost the beginning of time with creations like the wash board. The way people washed their clothes changed forever in 1908 when Alva J. Fisher invented the first electric washing machine. Dryer: In 1915 J. Ross Moore invented the first electric clothing dryer in North Dakota and patented the design by 1935. Microwave: Percy Spencer patented the first microwave on October 8th 1945. However this microwave, unlike it’s modern counterpart, was around 6 feet tall, 800 pounds, and nearly 5,000 dollars. It wasn’t until around 1965 that the microwave become affordable and kitchen ready. Refrigerator: The first modern refrigerator was designed in 1805 by a man named Oliver Evans. Unfortunately, Evans did not further pursue his refrigerator design until he moved to Philadelphia and met a man named Jacob Perkins. Evans and Perkins modified the refrigerator design and patented the first modern refrigerator in 1835. Dishwasher: Josephine Cochran, in 1893, invented the very first motor run dishwasher that used water pressure instead scrubbers to clean the dishes. Cochran got the dishwasher patented in 1897 in Shelby, Illinois. Air Conditioner: Willis Carrier invented the first modern air conditioner in Buffalo, New York in 1902. The air conditioner was patented in 1906. In 1914 Carrier was layed off from his engineering position at Buffalo Forge Company. This was a blessing in disguise as he later went on to co-found the Carrier Engineering Company. Still today the Carrier Engineering Company is one of the major manufacturers of heating and cooling appliances. Furnace: Alice H. Parker designed the first furnace in Morristown, New Hampshire in 1919. On December 23, 1919 Alice Parker’s patent was accepted for the first single source, gas-fired furnace. Some ideas are so widely believed they don’t even cause a second thought. Although often true, such common wisdom may be based on outdated or false information. Popular misconceptions about energy use can reduce home comfort and raise utility bills. Listed below are five energy myths that may be costing you. If you set the thermostat higher or lower it will heat or cool a room faster. No matter what the thermostat setting, air conditioners and furnaces work at the same speed. As a matter of fact, more energy may be wasted as the system continues to run to reach the further set point. If you leaving the lights on it uses less energy than turning them on and off. In most instances, the small surge of power needed to turn a light on is much less than the power that is wasted by leaving it on when it’s not needed. In fact, MythBusters busted this myth in one of their episodes years ago. If you close off vents you will reduce heating and cooling costs. Closing vents is a terrible way to save on energy costs. Cooling and heating systems are designed to distribute air evenly; closing vents causes pressure to build up. This pressure build up often results in duct leaks that waste energy. If you leaving a ceiling fan on it will cool a room. Ceiling fans circulate air which makes you feel cooler. This allows you to save energy by raising the temperature on the thermostat. However, they don’t cool the air. Leaving fans on in empty rooms wastes energy. Hand washing dishes is cheaper than using a dishwasher. It’s a widely believed misconception that dishwashers are convenient, but use more water and energy than hand washing. When in fact, washing a typical load of dishes in a dishwasher uses 37% less water. Likewise, using a dishwasher, rather than hand washing, may cut your annual energy costs by more than $40, according to ENERGY STAR.